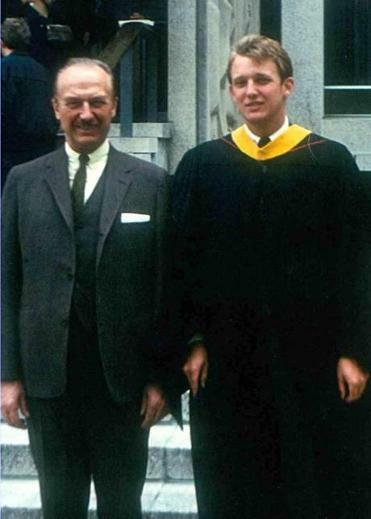 Donald Trump with his father, Fred Trump, after graduating from Wharton in 1968. PHILADELPHIA — The new student arrived at the University of Pennsylvania’s Wharton business school in 1966, driving a Ford convertible and sporting a mop of blond hair as outsized as his ambitions. A junior transfer from Fordham University in the Bronx, the young man was an outsider on the Ivy League campus in Philadelphia, with few friends. But that did not temper his swagger. When a professor asked students in his small class why they had chosen to study real estate, the new student stood up. Trump is the personification of a 21st-century America fascinated by the super rich and obsessed with celebrity, historians said. Some of the other students rolled their eyes. The brash, blunt, and sometimes bombastic personality that has helped Trump upend the early stages of the 2016 Republican presidential primary campaign — and which has been a hallmark of his business and reality TV entertainment careers — was already in full bloom during his college years, according to more than a dozen Wharton classmates interviewed by the Globe. But while Trump frequently boasts that his undergraduate degree from the elite Wharton School demonstrates that he has the brains and knowledge to lead the nation — “like, super genius stuff,’’ in his words — he appears to have left little impression on the school itself, outside a small orbit of fellow students. His former classmates said he seemed a student who spoke up a lot but rarely shined in class, who barely participated in campus activities, shunned fraternity parties, and spent most of his spare time pursuing his dream: using his advantages as the son of a prominent New York real estate developer to get an early start on the business career that would make him very, very rich. 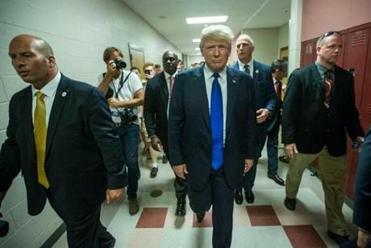 Unlike many of the students around him, who hoped to enrich themselves the old-fashioned way — that is, quietly — Trump had an in-your-face attitude about his quest for money from his first day on campus, said his former classmates. Yet even as he trumpets his connections to the school, he is anything but legendary on the campus. Few people there today even realize he attended and, having made no major donations to the school he and three of his children attended, there is no Trump Hall or Trump-titled anything at Penn. 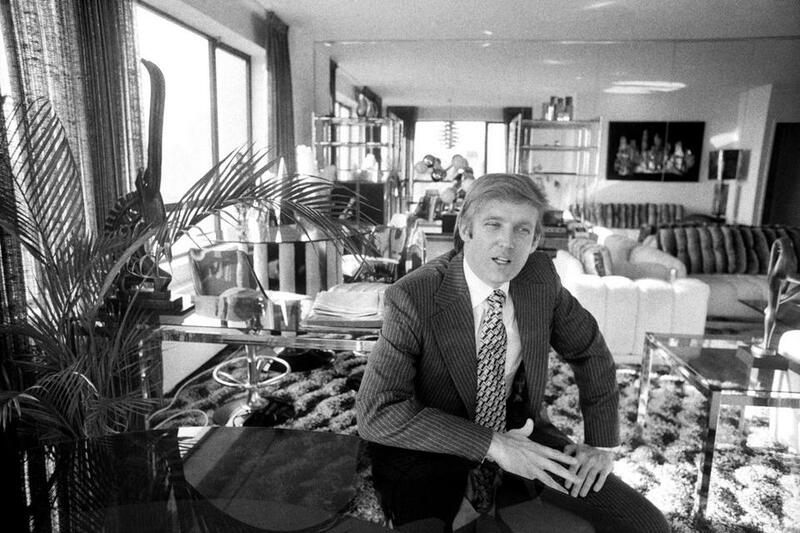 Donald Trump in the living room of his penthouse apartment on New York's Upper East Side in 1976. Even before arriving on the leafy campus at the University of Pennsylvania, Trump had some cause for confidence. During his high school years at New York Military Academy, a boarding school for boys 60 miles north of Manhattan, he stood out as an athlete, pitching for the baseball team and playing tight end on the football team. He also played soccer on a team dominated by students from Latin America, and was voted class “Ladies Man’’ by his all-male peers. Among his duties was storing and maintaining the M1 rifles for the cadets on his dorm floor. He was so meticulous about cleanliness that one former roommate remembers him folding his underwear into squares and stacking them neatly on the shelf. During rides home from school on a Port Authority bus, the young Donald would point out all the buildings built by his father, Fred Trump, a well-known developer who specialized in apartment complexes. Trump said in the interview that it was his having spent so much time away from home that led him not to apply to Wharton as a freshman. Instead, he spent his first two college years living at home in Queens and commuting to Fordham. After two years at Fordham, “I got in quickly and easily” to the Wharton undergraduate program, Donald Trump said. Around the time Trump was admitted, there were 8,000 candidates vying for 1,700 spots in the freshman class, according to school records. The process could be more difficult for transfer students like Trump. Tuition was $1,770 for the academic year. Trump arrived on a campus dotted with elm trees and featuring a prominent statue of Benjamin Franklin, surrounded by a combustible and violent city. The campus was gripped by anger over the Vietnam War. Trump received draft deferments while in college and, just after graduation, he was granted a medical deferment for what Trump has since said was bone spurs in his heels. Trump rented an apartment close to campus in a four-story row house that a fellow tenant remembers being infested with cockroaches. The area was so run down that a burned-out car sat out front for weeks before the city finally removed it. His senior year, Trump lived a few blocks away in an old building about to be condemned and torn down. The rooms were small, with little more than a bed, a closet, and a kitchenette with a small refrigerator and a two-burner stove. It sat across from a popular bar called the Bull and Barrel that offered hamburger specials for 20 cents. He drove a green Ford Fairlane convertible, and had a fondness for fried oysters from an off-campus Howard Johnson’s. He stuck out by carrying a briefcase on campus while most students toted books under their arms. Trump had one clear advantage over his peers: a financial head start from his father. With about $2 million in loans from his dad, he confirmed, he started buying up properties in Philadelphia soon after he arrived at Wharton. In a review of Philadelphia property records in the 1960s, the Globe couldn’t locate any with Trump’s name, but he said that even then he used aliases to hide his involvement. Trump said his good track record of flipping properties pleased his father. Trump the undergraduate declined invitations to attend frat parties. He didn’t drink alcohol then, and says he still doesn’t. He did not join any extracurricular groups. The man who would later promote his image around the world did not even show up for his college yearbook photo. In the yearbook’s “class prophecy,’’ with its predictions on where classmates would end up — gossip columnists, surgeons, Olympians, Supreme Court justices, were among the professions named — Trump isn’t mentioned. 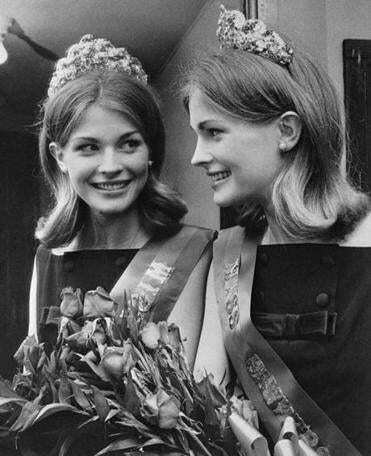 Candice Bergen, then 18, posed after being named Miss University of Pennsylvania in 1963. Trump was, however, around enough to take note, like most other men on campus, of one particular student: Candice Bergen, the homecoming queen who would soon trade campus life for Hollywood glamour, before later becoming famous as TV’s Murphy Brown. The Donald asked Candice out. She turned him down. “It’s true,” Trump said in an interview. Trump did make a big impression on the small group of fellow real estate students. They describe him as cocky but fun, boastful but with a bit of tongue-in-cheek. 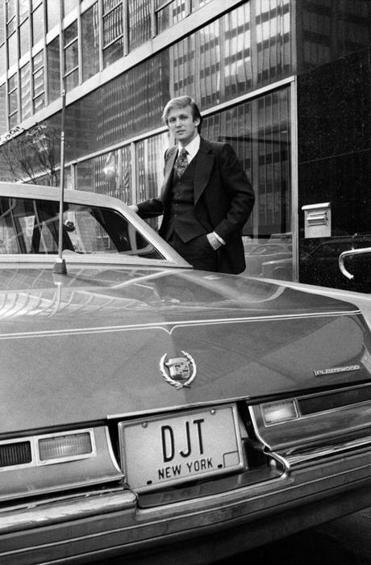 Trump posed with his Cadillac in New York in 1976. Trump was focused on building a real estate empire, one that would exceed the one his father had already amassed. Trump says he was well liked. But he himself did not think much of his peers. But Trump was not an exceptional student. He did not graduate with honors. Some in his classes don’t recall him raising his hand all that often. “Tact wasn’t his strong suit then and it isn’t now,” he added. “He was always kind of disdainful of the academic process. Trump says he was a good student, but he declined a request to release his transcripts — something that he called on President Obama to do in 2011 — saying he would only release his if Obama does first. 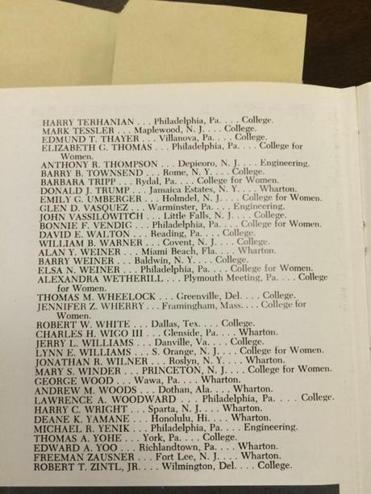 Donald Trump's name in the 1968 Wharton yearbook, on a page of those who were not photographed. 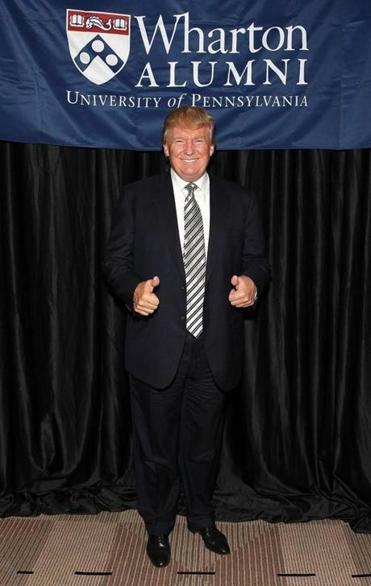 Trump was named entrepreneur of the year by Wharton in 1984, he was on the school’s oversight board in 1987, and his photo used to hang on a Hall of Fame wall honoring highly successful alumni (it was stolen in 1991, according to the school newspaper, and a spokesman for the school said he is not aware of any current Hall of Fame). But there is no physical reminder on campus of Trump’s presence there, in part because he has not donated enough. On graduation day, Trump and his Wharton classmates were seated near the front of the auditorium. The commencement address was given by William S. Paley, a Wharton alum who was a pioneer at CBS in a medium that Trump would later master: television. Trump, dressed in a black gown and yellow sash, paused with his father outside a granite building for a photo. Fred Trump is beaming, and his son would soon begin working with his father, building his own real estate empire. Trump would attempt to become, as he said when he first arrived on campus, the next Bill Zeckendorf, a legendary Manhattan developer known for flamboyance.